Celebrate the Grand Opening of the LEGO Store at Fashion Place! Join in a huge LEGO Grand Opening celebration and help a real LEGO® Master Builder construct an 8-foot tall model of the Hulk™ completely out of LEGO bricks! You’ll receive a free Certificate of Achievement for participating! 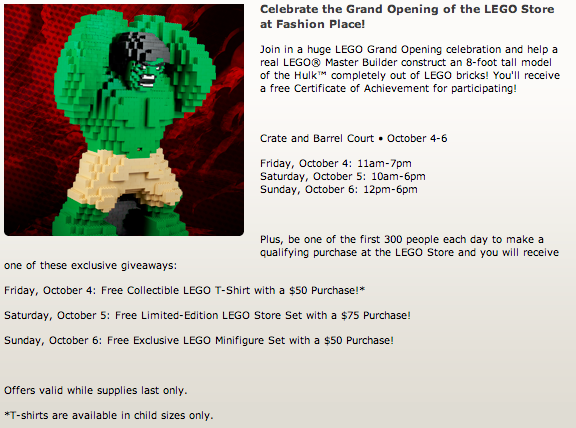 Saturday, October 5: Free Limited-Edition LEGO Store Set with a $75 Purchase! Sunday, October 6: Free Exclusive LEGO Minifigure Set with a $50 Purchase! Offers valid while supplies last only. *T-shirts are available in child sizes only. While there’s the disappointment that the opening day t-shirts are only in child’s sizes [does LEGO not realize who’s pocketbook is paying for the LEGOs, let alone the adult fans], the rest of the festivities are something that will find me hanging out at this location all weekend long. Once again, thanks to Rob for the link he shared in the comments of the last update. Sunday would be the day they’d get my money! Oh… and probably Saturday too! Who am I kidding? I will be there on both Saturday and Sunday. Skipping the Friday day as work won’t let this LEGO fan hang out all morning at the new store. So can you find $175 worth of sets to buy?